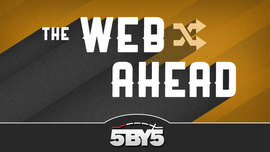 The Web Ahead, Episode #18: Me! Last Thursday, I had the rare honor and privilege of chatting with Jen Simmons as a guest on The Web Ahead . (I’ve also chatted with Jen in real life. That’s even awesomer!) As is my wont, I completely abused that privilege by chatting for two hours—making it the second-longest episode of The Web Ahead to date—about the history of the web and CSS, what’s coming up that jazzes me the most, and all kinds of stuff. I even revealed, toward the end of the conversation, the big-picture projects I dearly wish I had time to work on. The finished product was published last Friday morning. I know it’s a bit of a lengthy beast, but if you’re at all interested about how we got to where we are with CSS, you might want to give this a listen: The Web Ahead, Episode #18. Available for all your finer digital audio players via embedded Flash player, iTunes, RSS, and MP3 download. My deepest thanks to Jen for inviting me to be part of the show! i’m a bit confused that you didn’t talk about the recent -webkit-kerfufle..
tom: It got mentioned at some point, I think, but I guess the conversation just went in other directions. We were pretty much just going where the flow took us! I know I’m a little late on this one but I thought I would drop by and leave my comment anyway. I thoroughly enjoyed this episode and everything you and Jen discussed. Hope you decide to do another one soon and I’ll be looking out for your book!